5.7.1 If you want to sound like a native speaker of English when you speak English, it is not enough simply to pronounce each word correctly with the right word stress and sounds. Even adding correct sentence stress will not make you sound like a native speaker. It is necessary to connect the words in a sentence together using connected speech. 5.7.3 We (native speakers) speak English syllable by syllable, not word by word. 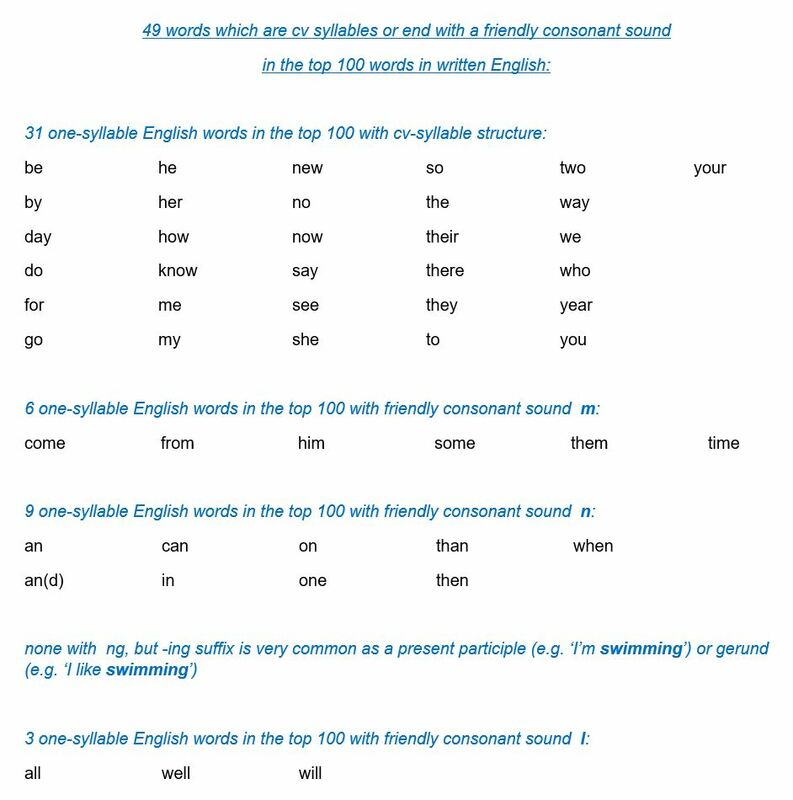 The aim is to STRESS the vowel sound in the stressed syllable of each content word, and REDUCE the rest of the syllables, then MERGE all of the syllables together. (See: Stress, Reduce, Merge – FREE download.) If you speak English word by word you will not sound natural: YOU – WILL – SOUND – A – BIT – LIKE – A – ROBOT! As we have said, pronouncing words correctly, with the correct word stress, sounds, and sentence stress is not enough. We need to connect the syllables. We need to fit English words together, but more often than not they do not want to play ball. They are too jagged – there are too many consonant sounds colliding – not to mention vowel sounds rubbing up against each other uncomfortably – to make the words as they are spelled flow freely in speech. Words don’t fit together very well in spoken English. They are like badly-fitting puzzle pieces. A language which looks great on the page (written English) has to be adapted and moulded to fit a native speaker’s mouth and vocal equipment as they speak it (spoken English). In reality it is unlikely that a student’s pronunciation would be that bad, but there is a high likelihood that they will make at least one error in pronouncing this word. My aunt has had a lot of problems with her leg recently. My aunt has had a lot of pro blems with her leg re cen tly. These six strong-stressed vowel sounds must be heard clearly for the listener to be able to understand the message in the sentence. We do this by putting more stress on them as we speak, but also by reducing (making weaker) the vowel sounds in all the other syllables of the sentence. For native speakers, the aim is to speak using only vc (vowel sound to consonant sound) sound connections between syllables. We literally take the language as a collection of words with individual pronunciations and mash them together until the sound connections are vc or friendly. We use connected speech techniques to achieve this – and did I mention that we do this automatically, at a subconscious level, without having to think about it, as we have been learning to do since we were babies? So, how can a non-native student of English hope to match that? By hard work! Practice, practice, and more practice! We prefer cv syllables which are front-loaded with a few consonant sounds, but we do not like vc syllables – e.g. at, in, on, of – because they are going to create cv sound connections than nice vc ones. 5.7.6 Now we must consider the ‘3’ in our initial equation: 3 friendly consonant sounds. There are 3 friendly consonant sounds that it is OK to end a syllable on in a cc connection, because they go well with any following sound. They are: m, n, and ng. (In some cases l can also be a friendly consonant sound.) For example, although ‘home time’ has a cc connection, it is perfectly ‘sayable’ thanks to the friendly consonant sound m. Try saying it yourself. It is no trouble to say – like a vc sound connection. In short, after pronouncing these sounds our vocal equipment ends up in a neutral place, ready to pronounce the next (usually consonant) sound. So the sentence is transformed from its word form – either on the page or in the speaker’s mind – into a series of sounds that transmit the information to the listener. Hopefully you can see from this fairly random sentence how many awkward sound connections there are, and in particular how many hard-to-pronounce cc sound connections there are. However, the result must be the same each time we speak: all sound connections will be either vc (vowel to consonant) or friendly. mai Yarn t Sa d Lo t Fpro blm swi tt Le Kree sn_ lii. There may be different ways to pronounce this sentence in the British Isles, since accents vary considerably, but this is the Standard Pronunciation version (RP) of the sentence. It goes without saying that if you pronounced each word and each sound in this sentence, your speech would sound incredibly stilted and unnatural – and just not at all like an English native speaker. This is the process we use that ensures the unhelpfully constructed words of English are changed into smooth, fluent speech – without all of the jagged edges that our words (as spelled) try to trip us up with. There are more sentence ‘walkthroughs’ with explanations in the FREE download: Stress, Reduce, Merge. 5.7.8 Why do we go to all this trouble to change written English (the words of the language as spelled) into a different spoken version? Maybe English is better as a written language than a spoken one. Throughout British history, written English has always evolved differently from spoken English, with many more people able to speak English than could ever read or write it. There was and remains a serious disconnect between the words on the page – the spelling of the words – and how we say them*. Maybe we just can’t speak English as it is written, so when a foreigner tries to do just that (as it may well be the norm in their first language), we reject their version as ‘foreign’. Well, yes, of course, it depends what your language goals are. I can assure you that as a teacher of English I have taught this method successfully to students from all levels – including beginners. I do not believe it is too hard to learn to use connected speech, or too complicated. After all, it is only a matter of 7-4-3. There are not 21 different features of connected speech; nor are there 49 possible sound connections, or 28 friendly consonant sounds. Well, it depends what you hear when you say the syllable for a few seconds. Also, the spelling can help. For example: with ‘they are’, if you say ‘they’ for a few seconds, the sound y reveals itself. In any case, the y is there in the spelling at the end of ‘they’. Similarly, with ‘you are’, if you say ‘you’ for a few seconds your lips automatically form into the shape of a w sound. With ‘teacher is’ the connecting r sound is present in the spelling, and it also reveals itself as you linger on ‘teacher’. 3. If a voiced consonant sound (see Lesson 1.6: Clear Alphabet) moves forward with FCL, it usually changes to its unvoiced equivalent (see chart below). For example, ‘big day’ becomes Bi Ktei, since g changes to k, and d changes to t; if v appears at the end of the first syllable, it will move forward as f – and so on. 4. If two of the same consonant sounds meet in a cc sound connection, we delete the first to leave a vc connection, for example: ‘old dog’ = Eul Dog (l is friendly here). 5. If t is the first sound in a cc connection, we will undoubtedly delete it (elision) and add a glottal stop, for example: ‘fitness’ = Fi_ ns and ‘get back’ = Ge_ Bak. 6. When h is at the beginning of the second syllable it will usually be deleted and the first consonant sound will move forward (FCL), for example: ‘met him’ = Me Tim. 7. Note down what happens in common words – e.g. ‘going’ = intrusion with w: Geu wing – and in common phrases, e.g. 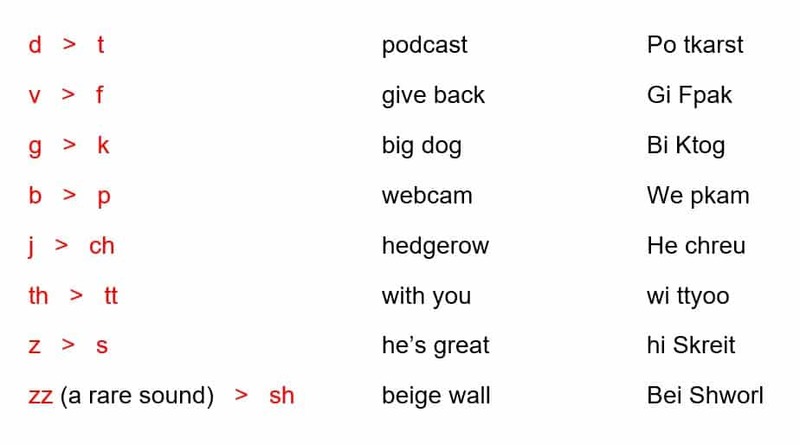 ‘had a’ = FCL and embedded schwa sound: Ha d, and ‘to the’ = t th (two ideal cv syllables together, creating vc sound connections. 8. Phrases with auxiliary verbs will usually be contracted in everyday spoken English, e.g. ‘you are’ > ‘you’re’; ‘she has’ > ‘she’s’; ‘I would > I’d’; ‘we do not’ > ‘we don’t’ – and so on. 9. Phrasal verbs usually follow the FCL rule, since they generally contain cv sound connections, with a final consonant sound in the first syllable meeting a vowel sound at the beginning of the second, in words like ‘in’, ‘on’, ‘off’, and ‘up’, e.g. ‘fall in’ > For lin; ‘get on’ > Ge ton; ‘take off’ > Tei Kof; ‘stand up’ > Stan dup (friendly) – and so on. Why not write down any more regularly recurring patterns that you find? See these books (FREE downloads) for more information: Talk a Lot Foundation Course (especially Lesson 4) and Stress, Reduce, Merge. It is going to take some hard work and plenty of practice to master connected speech in English, but it will be worth it to improve your pronunciation – bit by bit, step by step. Do not despair if you feel like this is too much information to take in at the beginning. You will get it with time, practice, and patience. There are 25 consonant sounds in the English language: 15 voiced and 10 unvoiced (see Clear Alphabet chart here). Remember – we move forward the first voiced consonant sound (FCL) and change it (assimilation) into an unvoiced consonant sound. We also change any other voiced consonant sounds that it stands beside in the second syllable, as in ‘big dog’ = Bi Ktog (above). What about the other 9 consonant sounds? h is never pronounced at the end of a syllable in English, so this situation could not happen. hh is not a truly native English sound (it comes from Gaelic) and is incredibly rare in everyday Standard Pronunciation English (Google words that end with hh), unless your word is ‘loch’. This sound is an exception. We would not move it forward, but just accept that it would cause a slight break in the sentence. Try saying: ‘Have you been to the loch lately?’ We would pronounce hh in all its extravagant glory and then pronounce the next consonant sound as it looks.